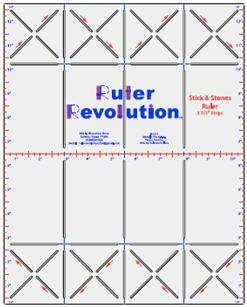 This ruler produces 2 ½" wide (un-sewn) rectangular shapes with triangles on one or both ends in lengths up to 12 ½" long - making multiple units at a time. The triangles can be sewn as mirror images (e.g. slanted diamond or chevron blocks) or going in opposite directions (e.g. house top or Christmas tree blocks) - or the triangle can be sewn on one end of the rectangle only (e.g. picket fence blocks). The rulers have lengthwise measurement markings for easy adjustments to produce different length strips. You can easily make the Sticks and Stones units with different fabics for the triangle at each end of the rectangle. No matter what results you wish to produce, there are NO little squares to sew or position in place.